The Performance Buoyancy Aid has an ergonomic design that provides better fitting and storage. 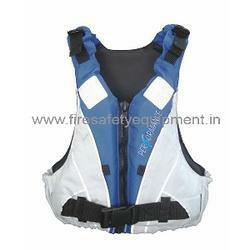 It features a polyester outer shell, while its buoyant material is Soft PVC.It offers a new level of comfort and buoyancy, while it features one waist webbing fastener for total safety, pocket with Velcro tape, plastic zip and SOLAS retro reflective tapes. Its reflective silver edging and advanced back neck area complete its design characteristics. Approved to the latest European standards for 50 Newton buoyancy aids, ISO 12402-5. All of its raw materials are certified per ISO 12402-7 and ISO 12402 -8, for higher strength, quality and durability. It is available in 3 sizes, in blue/white colour combinations.